Since leaving Farnham in 1978 the years certainly seem to have flown by. I have been married to Cathy since 1988. Cathy owns a pre-school and is opening another later this year. We have two children, Ross 22 and India 17. Ross graduated in the summer and is now training to be an airline pilot so that he can treat his parents to free flights in their dotage, and India loves studying history and playing her harp. We moved from the West country to Horsham, West Sussex in 1994 and have lived in the same house since, deciding it was easier to keep extending rather than move. For the last 34 years I have worked for the Conservative Party and am now the Field Director for the South East and London. During those 34 years there have been 8 General Elections, and I now work with staff and politicians who weren’t even born when I was the election agent in Plymouth in 1983. I have been fortunate to participate in several training trips to emerging democracies including Azerbaijan, Sierra Leone and Bosnia. 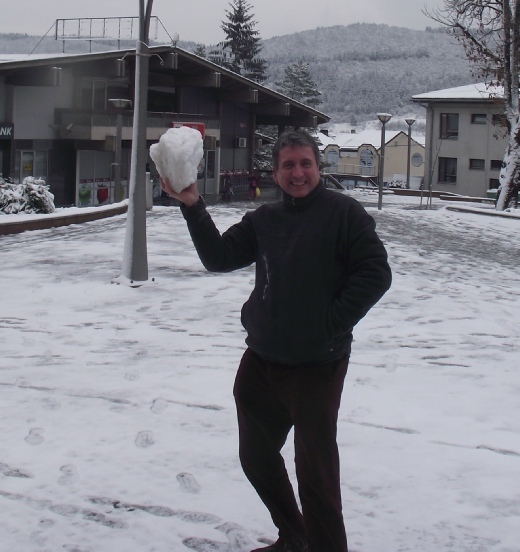 These trips are pretty intensive for us trainers, but there’s always time to relax such as this snow ball fight in northern Bosnia last year! A few years back I joined the Old Farnhamians Association and have become as involved time allows. It’s good meeting up with old friends who have equally aged, and seeing a school that looks better now than it did nearly 40 years ago.